Cakes and ice-creams are desserts to whom you cannot say no! They are simply irresistible. Moreover, extremely customizable and there is something for everyone. From 2 Minute Microwave Chocolate Mug Cake to luscious Roasted Almond Ice Cream with Chocolate Chips. If you master basic cake recipes like the Eggless Vanilla Sponge Cake or the Eggless Chocolate Cake Using Curds then you can use your imagination and create your own magical treats. From a simple topping of whipped cream to make the Black Forest Cake to an amazing dark chocolate ganache for the Chocolate Truffle Cake, you can try making various frosting or icing and create exotic treats cakes. 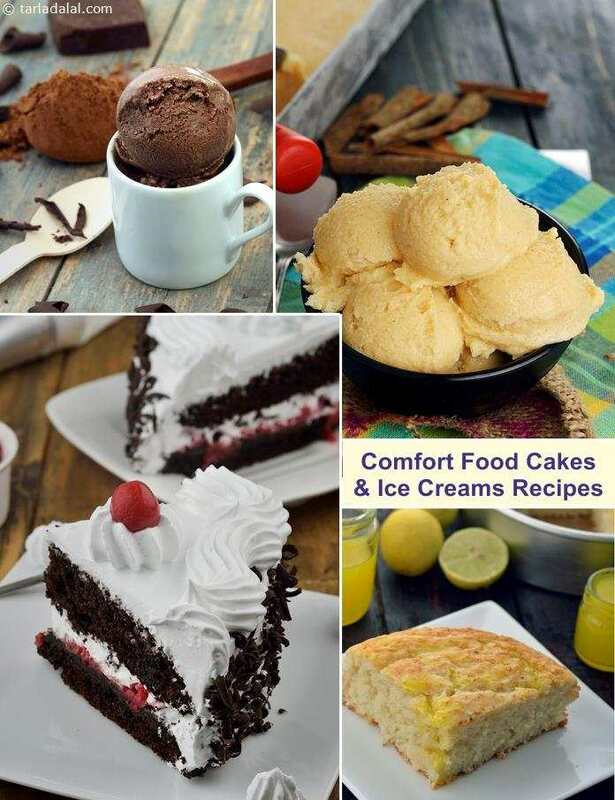 Enjoy our Comfort Food Cakes and Ice Cream Recipes.